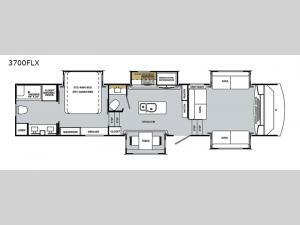 If you're looking for a fifth wheel filled with comforts, then this 3700FLX Cardinal Luxury by Forest River is for you! The front living area features three sofas and a 50" LED TV located on the mantle above the electric fireplace. In the kitchen, you will find all of the amenities needed to whip up your best meals like the stainless steel residential refrigerator, the 3-burner cooktop, and even a microwave, plus there is a kitchen island for added counter and storage space. Camping can be exhausting even in luxurious conditions as these, so make sure to rest up in the comfortable king-size Denver mattress at night. The rear private bedroom not only has an area prepped for the optional washer/dryer to be added, but also has it's very own private full bathroom!